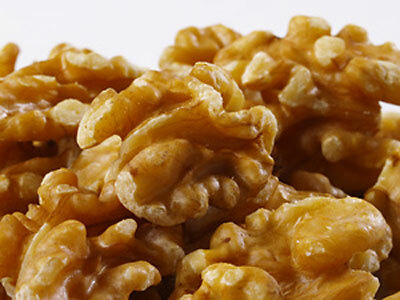 Do you know about all of the wonderful health benefits walnuts can offer? -Omega 3 fatty acids- per one ounce of walnuts, there is about 2.5 grams of alpha-linolenic acid (ALA). Per ounce, walnuts offer the MOST ALA compared to other nuts. – A plethora of PUFA’s (polyunsaturated fatty acids)- ideally between 20-35% of your energy needs will come from fats. 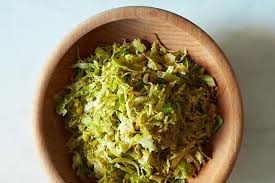 Of course, the more MUFA’s (monounsaturated fatty acids) and PUFA’s better! Each ounce has 2.5 grams of MUFA’s and 13 grams of PUFA’s! -4 grams of protein- giving you a boost of lean and mean muscle building power! -2 grams of fiber- keeping you full and focused! – An abundance of antioxidants: one study comparing 1113 different foods ranked walnuts as second place. Another study determined that walnuts have 10 different antioxidants. With more phenols (an antioxidant) than a glass of wine, walnuts are real good at fighting free-radicals! -Melatonin- the hormone that helps you melt into your pillow at night. Melatonin helps regulate sleep an wake cycles, allowing you to get the rest you need to conquer the day! Walnuts have been shown to help prevent cardiovascular disease, aid with weight management, slow down cognitive decline, and possibly assist with diabetes self management. Of course, walnuts aren’t a cure-all, but as a tasty and nutrient-packed nut, walnuts deserve a “whoa”! Try adding walnuts to salads, a homemade trail mix, sprinkled on top of a greek yogurt, or in your favorite baked good for an extra bit of nutrients! Crispy and Crunchy Kale Chips…Get your Crunch On! These kale chips are super easy and and a much healthier choice than classic potato chips! These kale chips are a great healthy and quick snack! Place oven racks in upper third. Preheat oven to 400F. Dry kale as thoroughly as possible using a paper towel. Add to a large bowl and drizzle with olive oil and salt. Mix well, massaging oil into kale to make sure it is all covered. Spread kale on baking sheet, making sure it is not overlapping. Bake until crisp, about 8-12 minutes, rotating pans once during. …start lowering your blood pressure and coronary heart disease risk! Check out this easy vegetarian three-bean chili recipe for a quick dinner loaded with heart-smart beans! 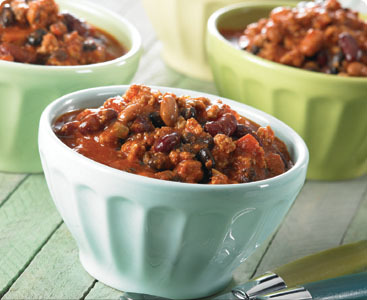 This quick and easy vegetarian chili recipe is loaded with heart smart beans! Heat the oil in a Dutch oven over medium-high heat. Add onion, bell peppers, and garlic; sauté 5 minutes or until tender. Add sugar and remaining ingredients, and bring to a boil. Reduce heat, and simmer 30 minutes.